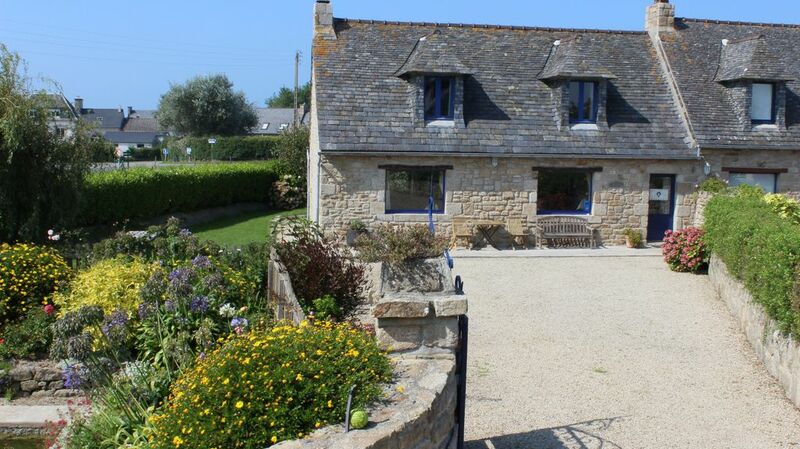 This cosy house has a neat interior decoration and since it has a typical Breton house configuration it has been done with care. Located at 200m from the sea, you will appreciate the wild richness of the marine littoral while enjoying the quiet Breton countryside. Located between the Leonard country and the region of the river mouths, you will be able to explore a very interesting region and its natural treasures. The vacationers will appreciate the clean and comfortable spaces where you will be welcomed by the owners, who will be available and discrete. Guest apartment with 3 stars. The house enjoys full independence with an inner courtyard and a small flower garden. Relaxation and quietness wait for you. The owners will welcome you and advise about the typical places to explore in the region. For more information on lodging, visit our website. The bathroom has two sinks and an enclosed shower. The house is equipped with games for children, a high chair, a cot with a bath for children and a changing mat. The loan of raclette is possible during the stay. La propriétaire est très accueillante, chaleureuse et attentionnée envers ses hôtes. Nous recommandons cette adresse les yeux fermés. Nous vous remercions pour votre commentaire et votre séjour. Nous serions heureux de vous accueillir de nouveau très prochainement. Vous nous avez dit ne pas avoir eu le temps d'aller découvrir l'Ile de Batz. L'accueil a été formidable. La maison est décorée avec goût. On s'y sent comme chez soi. Située près de la côte, pour les balades et les baignades, elle est au calme. Un lieu propice à la détente que nous recommandons vivement. Nous vous remercions pour cette appréciation . Vous êtes les bienvenus pour un futur séjour. Thank you for your appreciation. It was a pleasure to welcome you with your family and your dog. We appreciate your comments on our property and us. Ein sehr schönes Haus, sympathische und hilfsbereite Vermieter, tolle Gegend, sehr ruhig, ideal auch mit Hund. Wir haben in diesem Haus drei herrliche Ferienwochen verbracht. Bei unserer Ankunft wurden wir von der Vermieterin mit Gastgeschenken in Form von Gemüse, Cidre, bretonischen Keksen und Crepes begrüßt. Die Übergabe verlief reibungslos und schon am Abend ist uns der Cidre zum Opfer gefallen :). Wir haben uns schnell eingelebt und die Umgebung von Plouescat zu Fuß, mit dem Fahrrad und dem Auto erkundet. In den ersten beiden Wochen hat das Wetter mitgespielt und wir haben uns alle Strände in der näheren und weiteren Umgebung angesehen. Da uns kaltes Wasser nichts ausmacht, waren wir auch regelmäßig schwimmen. Es gibt viele große und auch kleinere Strände, aber unsere Favoriten waren Porsguen, Kerfissen und An Amiet. Wenn hier noch Palmen stehen würden, könnte man glauben in der Karibik zu sein. Einkaufmöglichkeiten gibt es in Plouescat reichlich, aber der Markt am Samstag hat seinen ganz eigenen Charme. Er findet um die alte Markthalle aus dem 16. Jahrhundert statt, die wirklich sehenswert ist. An jeder Ecke kann man in der Saison frisches Gemüse kaufen. Das Haus ist gut ausgestattet und man hat viele Möglichkeiten draußen zu sitzen und die Sonne zu genießen. Die Vermieter sind sehr zuvorkommend und hilfsbereit und stehen jederzeit mit Rat und Tat zur Seite. Wir werden gerne wiederkommen und bedanken uns noch einmal für die Gastfreundschaft, die uns entgegengebracht wurde. Nature holidays at the seaside, in the lively and interesting region of Brittany. For all of those who love to explore authentic landscapes, with a passion for history, traditions and heritage. Plouescat is one of the most entrepreneurial Leonard cities. Its amazing halls from the VXI century and rich castles recall the ancient times of men where they practiced trade and agriculture. The vast spaces preserved of Kernic Bay and the dunes of Keremma that invite you to explore the marine and dune environments, which are also ideal places to practice activities such as sailing or yachting. A true resort where you can test your luck at the casino or bet on the horse races. Les tarifs sont proposés pour quatre personnes. Il sera demandé 10€ par jour et par personne supplémentaire, (maximum 6 personnes enfant compris). Un montant forfaitaire de 45€ sera demandé en fin de séjour pour le ménage Pour les chiens, le tarif est fixé à 5€ par jour et par chien. Les modalités de réservation : il est demandé 30% d'arrhes à la réservation qui deviendra effective dès réception du contrat daté, signé et du règlement.